The Show: New Songs! New Characters! New Sets! All new LIVE show! The shining eyes and huge smiles say it all – the kids in the audience at a Hooley Dooleys concert are having the time of their little lives. The 45 minute “Super Dooper” show features songs from the bands newest album and DVD release of the same name. Not only does the show feature wonderful new sets, props and songs, it also introduces the children to two very special new friends as David, Antoine, Russell and Tickle are joined on stage by two Super Heroes, Penelope Perfect and Captain Catastrophe. The Hooley Dooleys sing songs about activities children love. Songwriters, David Butts and Antoine Demarest incorporate a broad range of musical styles in their writing. Whether the songs have a pop, funk, reggae or rock feel however, each Hooley Dooleys song invites the children to sing and dance along: “It’s really important to create music that kids can interact with, and makes them laugh. We love children, and we love making music” Antoine said. The Show: Scot Robin – who portrayed the role of “Buddy” has put together his own show for the very first time with some of Sydney’s best musicians. Buddy’s Back is one of the most exciting shows to hit the Australian cabaret circuit in years. During the two hour show Scot will perform over thirty of Buddy Holly’s hit songs including; “That’ll be the day”, “Peggy Sue”, “Raining in my heart”, “Oh Boy” and of course “Rave on”. Buddy’s Back has and will continue to excite audiences both visually and musically with its high energy performance, brilliant costumes and fantastic musicianship. Scot Robin as Buddy breathes life back into the legend that is Buddy Holly. Buddy’s Back has been toured all over Australia to packed houses and achieving rave reviews. 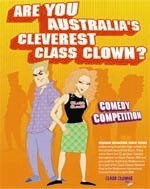 The Show: Now in its tenth year, Class Clowns is a national high school comedy competition held every year by the Melbourne International Comedy Festival. Throughout March 2005, professional comedians will lead students in Years 9 to 12 across the country through workshops and real-live showcase performances. Local heats cascade into State Finals and ultimately it all culminates on 31 March, when the National Final at the Melbourne Town Hall provides an opportunity for the funniest finalists to unleash their wit on a capacity cheer-squad of students, teachers and stars of the Festival. Winning Class Clowns is not just about fame and glory. The winning act receives $3,000 cash for their school. Sure beats doing detention any day! Whether you’re interested in competing yourself, or you’re a teacher with students who might be interested, you go about the process in pretty much the same way. 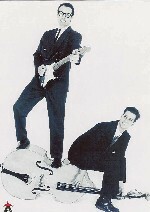 The Show: Bop with the boys from The Delltones appearing live. 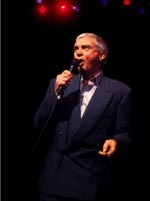 The Show: The legendary hit maker GENE PITNEY with the “Maurice Merry 12 piece Orchestra” performing live his greatest hits including ‘Twenty Four Hours from Tulsa’, ‘Half Heaven, Half Heartache’, ‘It hurts to be in Love’, ‘Town Without Pity’, plus many more. Don’t miss this opportunity to see this remarkable entertainer live in concert for what will truly be an exciting and memorable performance. After more than thirty years in show business, Gene Pitney is still a pop superstar with millions of fans around the world. A long and winding road has taken Gene from his humble beginnings in Rockville, CT, to the high profile stages of the world’s greatest cities: Carnegie Hall in New York, the Palladium in London, and the Opera House in Sydney. It takes talent to reach the pinnacle of success in international show business and stay firmly entrenched at the top for over thirty-five years – outstanding talent! Gene will be supported by the very talented singer/songwriter Rodney Vincent.